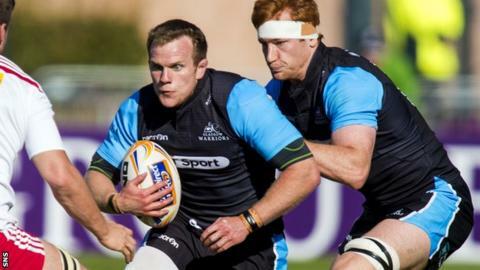 Scotland back-row forwards Rob Harley, Ryan Wilson and Chris Fusaro have penned new two-year contracts with Glasgow Warriors. Seven members of their current squad had already committed themselves to the Pro12 club. Wilson, 26, and Harley, who is a year younger, were both born in England but have 16 and 17 caps respectively for Scotland. Kirkcaldy-born Fusaro, 26, has represented his country four times. All three players first signed for Warriors in 2010, with Harley so far making the most club appearances - 113 - since arriving from West of Scotland. The forward who has captained the side on a number of occasions was delighted to extend his stay with the club he supported before turning professional. "It was great to get a taste of the success we had last year, so my aim in the next two years is to keep winning trophies and push on in Europe," he said. "I'd like to use the excellent coaches we have here to improve my game and become a better player." Wilson, who joined Glasgow from Moseley, was looking forward to extending his 104 Warriors appearances. "This is my sixth season at the Warriors and I've loved my time here," he said. "Being involved at the Rugby World Cup with Scotland was incredible and I want to continue to play at the highest level. "By staying at Glasgow, I'll have the opportunity to do that." Fusaro, a product of Howe of Fife, has made 109 Warriors appearances and is also keen for more success. "Glasgow's been my only club since I started professional rugby and we've come on a long journey, but I still think we've got a lot further to go. "I signed the same year as Ryan and Rob and we've formed a tight-knit group in the back-row." Jonny Gray, Finn Russell, Pat MacArthur, Fraser Brown, Alex Allan, Sila Puafisi and Ali Price have also recently extended their Warriors contracts.